Courtesy of my brilliantly creative cooking friend, Masako Shimamoto, I am able to share a tasty and authentic Tokyo-style ozone. 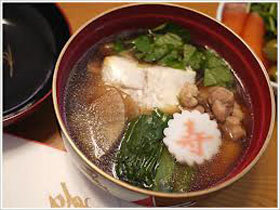 The soup is traditionally is made to celebrate the New Year. As in many traditional Japanese dishes, ingredients are sparsely used. The idea is to create a pretty picture in the bowl. Let your inner artist emerge! Note: A lighter colored, more salty oosu-kuchi-shoyu ???? is traditional. Soak the kelp in the four cups of water for 30 minutes. Bring to a boil. Remove kelp and add bonito. Turn off the stove flame. Let almost all the bonito flakes sink to the bottom of the pan. Place a large bowl beneath a strainer (which is lined with a paper towel.) Pour the liquid out to filter out the bonito. Return the soup stock (dashi) to the stove. Add chicken, kamaboko, carrots, shitake, pre-boiled taro, your choice of leafy greens and mochi. Bring to a boil. (Check your mochi to make sure it is soft enough to eat.) Flavor with soy sauce and sake as you like.